Creating high quality menswear for over 40 years, Barkers have made a name for themselves in New Zealand and are staple in many Kiwi men's closets. And with their made to measure experience, it's even easier for groom's to find and create the perfect suit for their wedding day. We talk to Barkers ahead of their appearance at New Zealand Weddings Magazine's Collection at New Zealand Fashion Week about what we can expect to see, plus some of their top suiting tips. 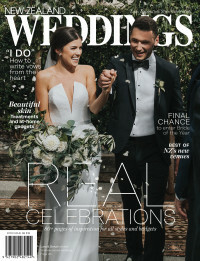 Can you give the New Zealand Weddings readers a teaser sentence about what we’ll see on the runway this year from Barkers? Barkers: We want to showcase a range of suiting for all wedding occasions, whether it's a black tie event, or a casual ceremony, while always focusing on elegance and confidence. What details do you think will be big in groom's wear in 2018, and beyond? Details such as a softer construction in suiting and a move towards wider lapels and relaxed tailoring. What detail would you love to see make a comeback, when it comes to groom's wear? Self tie bow ties – it is worth the effort and every man should be able to tie one. What kind of emotion or feeling do you want to evoke at New Zealand Fashion Week with your collection? A sense of summer warmth, elegance and confidence. Having confidence in what you're wearing allows you to enjoy your surroundings and every moment of your wedding. What's one piece of advice you'd give grooms when it comes to choosing their overall look? Think not what the photos of your wedding suit will look like now, but in five or 10 years time and you cannot go wrong. Oh, and ensure you get a suit you can dance in! Barkers will show their latest collection at the 2017 New Zealand Weddings Magazine Collection Show at New Zealand Fashion Week. Click here for all the details. Our annual Ultimate Beauty Event will be held on Saturday 2nd September, tickets are $35 and you'll get beauty tips, how-tos, manicures, cake-tasting, bubbles, food, and a goodie bag worth double the ticket price! Click here for all the details.